The country's borrowing limit is currently capped at $16.7tn (�10.7tn). "Extraordinary measures are projected to be exhausted in the middle of October," Mr Lew said in a letter to House Speaker John Boehner and other lawmakers. 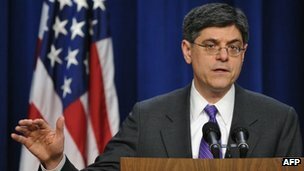 "At that point, the US will have reached the limit of its borrowing authority, and Treasury would be left to fund the government with only the cash we have on hand on any given day," he said. The cash balance at that time is forecast to be about $50bn, which Mr Lew said, would be "insufficient to cover net expenditures for an extended period". He said: "Operating the government with no borrowing authority, and with only the cash on had on a given day, would place the United States in an unacceptable position." There have been tense debates between the White House and congressional Republicans over the government's debt ceiling, spending cuts, and other fiscal matters. They only reached a compromise on the day the government's ability to borrow money was due to run out. The delay in reaching a deal at that time led ratings agency Standard & Poor's to downgrade the US for the first time ever, which sparked volatility in the financial markets. The compromise also included a series of automatic budget cuts known as the "sequester" which came into affect earlier this year. However, in his letter Mr Lew argued that raising the debt limit does not increase government but "simply allows Treasury to pay for expenditures [the] Congress has previously approved". He warned that a delay in raising the limit "would cause irreparable harm to the American economy". ''Such a scenario could undermine financial markets and result in significant disruptions to the economy,'' he said.